Christmas is a joyous time of year for most Americans, but if you have bad credit, it can be difficult. While everyone else is shopping for gifts and preparing a holiday feast, those who have had credit problems can be left struggling. Thankfully, there are some credit cards offered to those with bad credit this year. You can sign-up for one now, and enjoy a new line of credit before the holidays. Alternatively, there are secured credit cards available to those with nearly any credit profile. These cards work much like any other credit card, but they require the payment of a refundable security deposit before an account can be opened. Typically, the amount of the deposit becomes your line of credit. You will receive a statement every month, and will have to make a monthly payment. And if you choose to carry a balance, you will be assessed interest charges. Nevertheless, a secured card can offer the convenience and security of a standard credit card, as well as some travel insurance and purchase protection benefits. While having a secured card may not extend you additional purchasing power for the holidays, it is a great way to rebuild your credit. When secured card users are able to make their payments on-time each month, many are able to qualify for a standard, unsecured card within a year, just in time for the holidays next year. Capital One is a major credit card issuer and it offers its Secured Mastercard to applicants with all credit histories, especially those with bad credit or no credit. New applicants must first submit a refundable security deposit of $49, $99, or $200, depending on their creditworthiness. Then, Capital One will offer you a credit line somewhere between $200 and $3,000, depending on the size of your security deposit. Unlike most secured cards, you may receive more credit than your deposit. But just like other credit cards, you will receive a statement each month, and must make a minimum payment. Capital One offers its CreditWise app, which allows any consumer, not just Capital One cardholders, to view your credit score and see how your credit improves with on-time payments. With Capital One’s Credit Steps program, you can receive a higher credit line automatically when you make on-time payments for the first five months of your account. 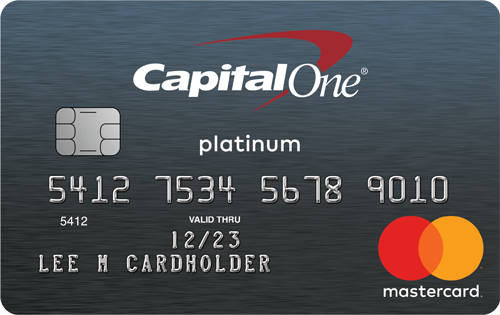 Other benefits of the Capital One Secured Mastercard include extended warranty coverage, auto rental insurance, and a price protection policy. The standard interest rate for purchases is 26.99% (Variable). There is no annual fee for this card, and like all Capital One cards, no foreign transaction fees. The Official NASCAR Credit Card from Credit One Bank offers cardholders 1% cashback on all eligible purchases, but what qualifies will depend on your credit. Those with excellent credit can get 1% can back on all purchases. Those with average credit or bad credit will still get 1% cash back on eligible automotive and gas purchases. All cardholders get double cash back on any purchases made on NASCAR.com and special access to NASCAR® deals and bonuses. Your APR will also vary depending on your credit, but it will range from 20.24%-26.24% Variable. The Official NASCAR® Credit Card from Credit One Bank® gives the flexibility to pick your payment date. You also get access to free monthly credit score tracking and reviews for possible credit line increases. In addition, you have the option of receiving email or text messages to alert you when you have a payment due. The annual fee for this card ranges from $0 to $99 depending on your credit, and there is a 3% foreign transaction fee. The First Access Visa® Credit Card has an easy and secure online application. You will be charged a program fee but only if you are approved for the card. Once approved, you will have access to a certain credit limit, and your timely payments will be reported to all three credit bureaus. You may be able to receive your card more quickly with optional Expedited Processing (additional fee applies). The Milestone® Mastercard® – Bad Credit Considered is offered by Mid America Bank & Trust Company to applicants who have any credit history including bad credit. If you have bad credit, this is a good choice if you don’t want to place a deposit down on a secured card. It has an annual fee between $35 and $99, depending on your credit profile. You also get a 25-day grace period at the end of each statement cycle in which to make full payment to avoid interest charges. Finally, this card has a reduced 1% foreign transaction fee, not the 3% fee that most cards have.